These days, the fabric that is mostly used for the decorations at a wedding is Tulle. 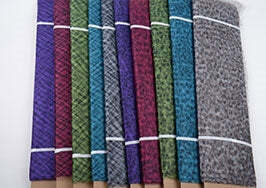 BB Crafts is presenting the finest quality animal printed tulle bolt at affordable rates. This is an amazing product that can be included in party decorations, dress embellishments and even for making the cute looking hairbands and other accessories. The best part about buying with BB crafts is that here you can get hold of almost all the shades that you can imagine to use in your wardrobe decorations. These animal printed tulle bolts look classy when used smartly to decorate the venue for some house party. We are providing this product with amazing offers on unbelievable rates with the pure polyester making. So, if you are in search of some fabulously printed tulle bolts, then we have it all for you.